The view that “God is love” is the deepest understanding expressed in the New Testament. After reading through Thomas Jay Oord’s, The Uncontrolling Love of God, I was inspired to reexamine my own views on theology, providence, and the nature of love. Oord does a phenomenal job of highlighting the necessity of a view of God as love that is biblically based, logically consistent, and capable of accounting for randomness and genuine evil in the world. As a process theologian, I share many of the conclusions that Oord and other open theists hold, and there is little to say to improve on most of Oord’s main points. However, as a rather staunch believer in the importance of religious pluralism and the reality of multiple religious ultimates—of which God is but one—I feel that I can add a new voice to the discussion of God’s relationship to love. I suggest that rather than understand God as love, we shift to speaking of God as in love. If all things are within God, and God is within Love, then all things are, in fact, in Love as well. This makes at least one important component of love, Eros, separate from but related to God’s eternal nature and also properly an ultimate or a component of ultimate reality itself. God as in love is analogous to the gravitational pull of two heavenly bodies. The attraction of two or more bodies extends far beyond the physical reach of the matter comprising the objects. In much the same way, the gravitational influence of Love radiates out embracing, protecting and drawing bodies, entities, and objects into a state of togetherness. Love pulls all things into a kenotic state of self-giving or a sharing of information. The force field of love is the endless renewable catalyst, which binds the two ultimates (God and a World) together in a ceaseless creative dance. The shift being suggested here is to modify the notion that God’s eternal nature is love and that God, immutable, cannot change this. In its place is the belief that God is, literally, in love. God is in the pull of Eros, an ultimate that vacillates endlessly between pulling all things into a state of togetherness and then apart again for a moment of partially determining self-creativity. Eros exists automatically, in the process view, where God has never been alone; instead, there has always been God and some World or other. I propose that God’s free choice to love came about in the very first act of co-creation as God and the World were forced into states of togetherness, but not forced to love this fact! Isn’t choice the fundamental aspect of genuine love? If one had no choice but to love, then can we call this perfect love at all? I fully concur that creation, including humans, are capable of freely deciding to love and choosing how to express it, but I would add that God must also be free to love or not. “I believe it is impossible to worship wholeheartedly a God who loves halfheartedly.” I wonder if a God who cannot choose not to love might be a God who loves halfheartedly. The question becomes, in what sense is God love, if his eternal nature is not eros, at least not in this broadest understanding. Essential kenosis or self giving is metaphysically necessary and logically prior to choice. If God were truly unconditional love, how do we explain the seemingly conditional nature of the Old Testament covenants? Why is one group of people singled out as chosen? Why are only certain individuals worthy or ritually pure enough to enter the tent of meeting and the holy of holies? The Torah expresses clear conditions for being worthy to be in God’s loving presence. This argument can be extended into the New Testament as well: slavery is accepted, the role of women is hardly equal and even Jesus has an inner circle who are given special instruction not for outsiders. However, over time as the early Christian movement extends beyond the Jewish population, an all-loving and universal God and church begin to emerge. Perhaps the God of the NT is not the same God as the God of the Hebrew Bible or perhaps the same God has grown in wisdom and in virtue, has changed, so God has moved beyond the former versions of Godself. 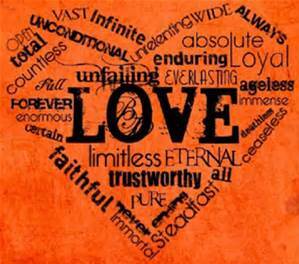 The best view of Love as God’s character, consistently expressed throughout the Bible as a whole, is storge. God is Abba, our heavenly father. Storge is a family oriented love and affection. Our earthly father would and should protect us from being raped or blown up by bombers. It would seem very odd if humanity could do what God cannot. Oord states that, “Creation differs from God in that free creatures are free both in deciding whether to love and in deciding how to express love. They do not have eternal natures in which love is preeminent and necessary. Because of this, for instance, creatures can choose sin and do evil. God’s nature is love, however. This means God can neither sin nor do evil. But God can both want to love us and love us necessarily because love is essential.” God is in love in a second sense, because God does enjoy sharing and caring for the universe that has been co-created. God expresses agape by sharing with all things, storge by caring as a father and having affection, and philia by the fondness of friendship between co-creators. Oord masterfully summarizes, as others have noted, that logical contradictions are not genuine limitations on God’s sovereignty, but choosing not to love does not seem logically contradictory. Choosing not to love is a far cry from making a stone so heavy that even God himself cannot lift it or changing the past. To summarize, God is necessarily kenotic and self-giving, but not of his own nature. Rather, the mandatory aspect of this self-giving is due to multiple religious ultimates, one of which is Eros, an attractive gravity-like, impersonal force pulling all things into a state of mutual sharing. However, once this process started, God freely chose and continues to choose to be in love with the world in the second sense: agape, storge, and philia. Bio: Darren Iammarino is a process theologian and professor of humanities and religious studies at San Diego Mesa College where he teaches world religions, New Testament and Old Testament. His most recent book, Religion and Reality: An Exploration of Contemporary Metaphysical Systems, Theologies, and Religious Pluralism, explores many themes covered in the above material and can be found on amazon. He can also be reached on Instagram: @driammarino. Darren, why does it seem very odd if humanity could do what God cannot? Just wondering. Does God necessarily have to have all the capabilities (powers) of humanity? You make your point very well, by the way. If God could not choose to love then how can God BE love, if love is indeed necessitated by free choice? However the view of Essential Kenosis is that even though human beings can violate the freedom of other people in order to get our way (prevent a loved one from being raped), God cannot. Love cannot take back the freedom given. If God COULD then why isn’t God doing that consistently? If God has grown out of being a tribal god and has become more universal, why isn’t God’s storge more universal as well? To quote an often used sentiment of late, many people would have the right to say in that case, “He ain’t MY daddy!” I am wondering if it is the case that human expressions of love are indeed necessitated by free choice, but God just IS love (I know that is the opposite of your thesis here), but God cannot be anything other than what God is. God is love like liquid is wet.